Steven Allen (M.A. 1974), Associate Dean for Graduate Programs & Research, Poole College of Management, North Carolina State University, Raleigh, received the Alexander Quarles Holladay Medal from NC State in 2016; this is the highest honor given to faculty at NC State. Terry-Ann Craigie (Ph.D. 2011) was promoted this spring to Associate Professor with tenure at Connecticut College. This summer, she was named an Economics Fellow at the Brennan Center for Justice at New York University School of Law. She will be spending the coming academic year at the Population Studies and Training Center at Brown University. Chris Douglas (PhD 2007) has been named President-elect of the Missouri Valley Economics Association. His term as President will run from November 2018 to November 2019. He has also been named as a new co-editor of the Journal of Economic Insight, (formerly The Journal of Economics) which is published by the Association. Seth Gershenson (PhD 2011) was promoted to Associate Professor with tenure, in the School of Public Affairs at American University, effective August 2017. Paul Polzin is the Director Emeritus at the Bureau of Business and Economic Research at the University of Montana. He has been active in AUBER for more than 25 years and has served numerous terms on the Board of Directors and the leadership track of the organization. He lives in Missoula, MT. 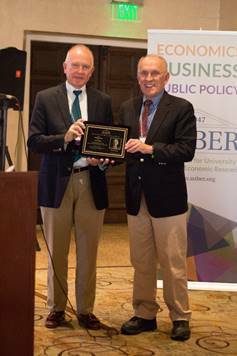 Paul Polzin (PhD 1968 and on the right in picture) presents the 2017 Polzin Paper Prize to Tim Sather of Indiana University at the Fall Conference of the Association of University Business and Economic Research (AUBER) held in Albuquerque NM. The Polzin Prize includes a $500 stipend and is a refereed competition for the best paper submitted to the Fall Conference.